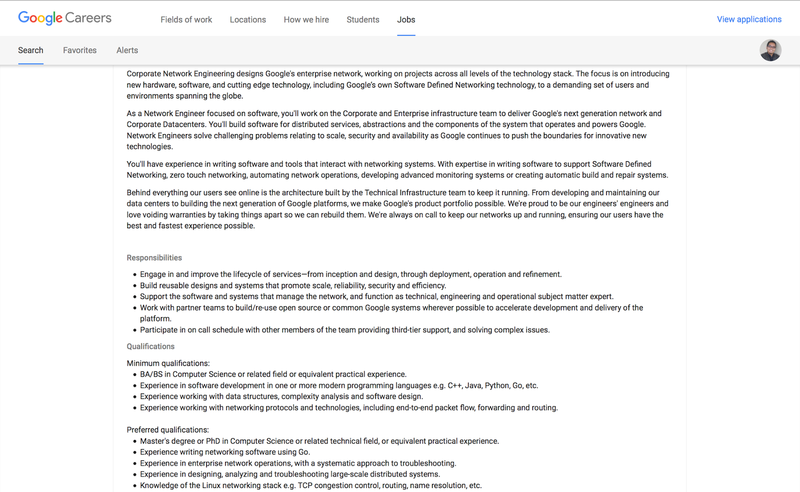 So you want to work for Google as Network Engineer? Check out one of the job ads here. I pasted the screenshot below just in case the ad is removed once the position is no longer available. "You'll build software for distributed services, abstractions and the components of the system that operates and powers Google." 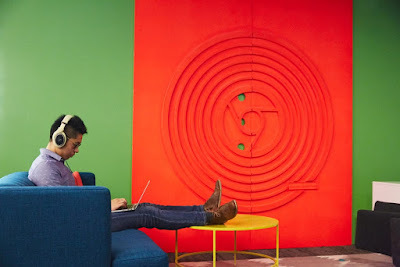 OK, even this is not common in Network Engineer job description, it makes sense since Google is running one of the world's largest networks to connect its data centers that are scattered all around world. As minimum requirement, you must have experience in software development in one or more modern programming languages e.g. C++, Java, Python, Go, etc. And learn how to code using "Teach yourself Python in 24 hours" won't be enough since it is expected for you to have experience in data structures, complexity analysis and software design. 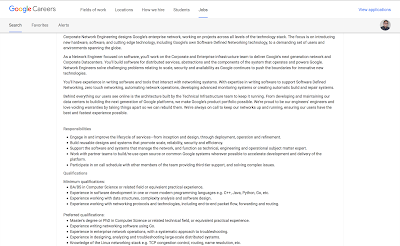 Is Google really looking for Network Engineer (NE), and not Software Engineer (SWE)? Yup, you still need to have expertise in networking protocols and technologies, including end-to-end packet flow, forwarding and routing. Google knows that a world class distributed computing infrastructure must run on world class networking infrastructure that is operated reliably and at scale. When network capacity in the company's data centers has grown so fast that conventional routers and switches can't keep up, Google could not buy, for any price, a data-center network that would meet the requirements of its distributed systems. So the engineers decided to build its own instead. And someone like me who relies on 3 CCIEs and CCDE only won't be qualified to apply. Before you ask if it is still needed to pursue certification or not, let me say it again: you still need in-depth networking knowledge. You still need to know OSPF, ISIS, and BGP in details. And you may use that kind of certification to build the expertise. But don't turn into certification junkies just like a younger me once! Especially if your target is to only pass the exam, it won't get you to Google for sure. Once you understand network engineering, learn software engineering and how to design, analyze and troubleshoot large-scale distributed systems. In this company, and similar companies that build and maintain large-scale networking like Facebook, Amazon and others, Network Engineer is expected to write software and tools that interact with networking systems, to support Software Defined Networking, zero touch networking, to automate network operations, and to develop advanced monitoring systems. Google is definitely looking for someone who is at minimum already in Phase 5 as per my Network Engineer evolution, that will progress to Phase 6 someday. And during my past 440 days in Google, I'm so lucky to be surrounded by these guys.